This news comes at a moment when hate crimes are at an all-time high. Whenever the government profiles a people for who they are, not anything they have done, it emboldens people to act on their bias. On Friday night, a Sikh man was shot in his own driveway by a man who said “go back to your own country.” A little more than a week ago, Srinivas Kuchibotla, an Indian American engineer was killed by a man who yelled “get out of my country. And we just received reports of the killing of Harnish Patel, an Indian American in South Carolina. The motive is unknown but in the context of skyrocketing hate against Muslims, Jews, Hindus, and Sikhs, our communities are shaken. Hate breaks bone and sears flesh. But it also poisons the air we breathe. Right now, thousands of families — Muslim, Sikh, Hindu, South Asian, and Arab Americans – are having a hard time breathing. They tell me they are canceling camping trips, keeping their kids from school, reluctant to go out. Today’s ban fuels the fire. It makes our country less safe, not more so. No refugee since 9/11 has been convicted of domestic terrorism, nor has any immigrant from the countries targeted by the ban. Instead, the ban endangers refugees fleeing war and persecution, establishes a de-facto religious test for immigrants, and threatens our people and Constitution. What can we do? #RevolutionaryLove calls us to see people who are not like us as sisters and brothers – and stand up for them when in harm’s way. 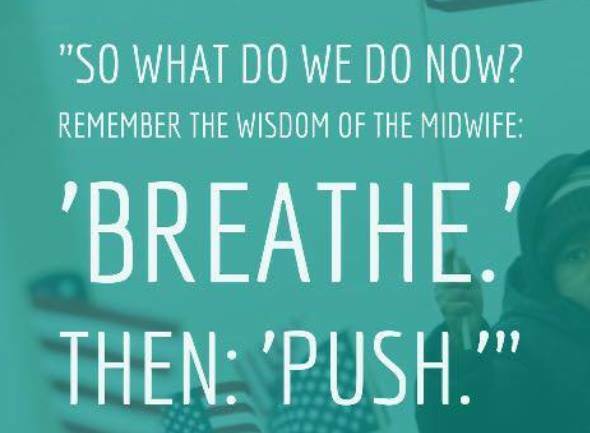 We need you to breathe with us, and push with us. 1. CALL CONGRESS: 202-224-3121. Sample script: Hi, my name is ___ and I’m a constituent. I don’t require a response. I’m calling to express my strong opposition to the new Muslim ban. Just like the last time, this ban punishes Muslims, immigrants, and refugees for who they are, not anything they have done. It also emboldens hate crimes against Muslims, Sikhs, and so many others. Hate crimes are now at an all-time high. I am calling you to show my love and care for these communities. Please take a strong public stand to protect our people and our Constitution. Thank you. 2. REACH OUT. Call or text your neighbors and friends who are Muslim, Sikh, Hindu, Arab, or South Asian to tell them that you are troubled by the ban and hate crimes and are here to support them. Ask them what they need. Similarly, you can reach out to people you know in immigrant communities who are reeling from raids and offer your solidarity and support. This is #RevolutionaryLove in practice. 3. MAKE PLANS TO SHOW UP. Nothing is more powerful than showing up in direct actions. On Wednesday, we are championing a Day Without a Woman with our partners at the #WomensMarch. You can participate in three ways: do not work, do not buy anything, and/or wear red. Post why you are striking – and who you are standing in solidarity with – use #NoBanNoWallNoRaids and #RevolutionaryLove. Check out resources and events held around the country this week here: https://nobannowallnoraids.wordpress.com/…/muslim-ban-2-0-w…. We will list upcoming calls to action at www.revolutionarylove.net.